Posted on Tue, Jan 17, 2012 : 5:56 a.m.
Sweet little Madeline was abandoned outside and brought to the Humane Society of Huron Valley by neighbors who were worried for her safety. From all indications, Miss Madeline much prefers an indoor life. This brown and orange tabby cat has beautiful fur, and, from our exam, we estimate her age to be about 5 years old. Madeline is a little shy at first, but all she needs is some sweet talk and to have her face stroked gently, and she turns into a mushy pile of kitty love. She's going to flourish in a quiet home where she can feel safe and adored by her people and in return, she'll purr at you with the sweetest eyes in the world.... she really has such an adorable little face. 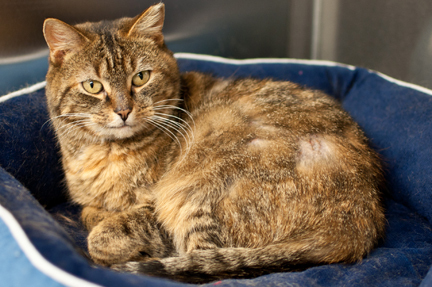 She adores a nice comfy cat bed and would love to hang out with you and maybe even be your new lap cat. Some cats can actually have allergies and Madeline did come in with skin sores on her face and neck. These conditions are usually secondary to either food or environmental allergy. These ulcers commonly named rodent ulcers, tend to be chronic, sometimes going away but reoccurring at a future time. In Madeline's case, they do not seem to cause her any discomfort in terms of her ability to eat and drink. At this time, Madeline is being treated with an injectable steroid that is usually very effective in helping to resolve the ulcers and the allergic dermatitis in the short term. Glass bowls are recommended for her, and her new family should keep any eye out for any future flare-ups and be willing to provide the medical care she might need. She is gorgeous! I'm sure she will have no problem finding a great home. Tue, Jan 17, 2012 : 10:39 p.m.